“Fusion Cash”, by Tyler Derheim and found at fusioncash.net, is GPT web site, or “get paid to” complete various tasks provided by their market research clients – at a rate of less than half the minimum wage. I say less than half because you have to factor in the time you waste on registering for each survey or other tasks every single time, and also because what you “earn” on them would be insulting to most people. Then you factor in the amount of surveys that either are defective, you don’t qualify, don’t credit you for completion, etc., and in all of these you waste all that time I mentioned above. If you do complete and are credited on a task successfully, it takes a long time to reach the payout cap because those tasks pay so low. You may want to ask yourself if you would be willing to work at a burger joint for less than three dollars an hour (or even 6 cents an hour on certain tasks! ), then realize that is what you’re doing when working for Fusion Cash or any other survey site just like it. Then again, there are members who just don’t care and do this as a hobby, which is about all you really should consider it to be. Then there are the trial offers and shopping tricks. Sure, trial offers may earn you the most points, however, signing up for 40 to 50 all going on different days could be dangerous. Keeping track of all those balls in the air could cost instead of make. If you lose track of a few, those companies will charge you full amounts after trial expires, and they actually count on this mistake from a lot of members. That is because you will be giving out your credit card info at sign up and possibly losing far more than you would have made. My take on the shopping tasks part is that spending your own money to get a very minor cash back credit. A discount, or worse, rewards points, should not be considered earning. There is also a very high chance Fusion Cash and the participating “mall stores” will be making a far bigger sales commission than the pittance you make in cash back. Another of the trials involves watching videos – for about a penny to 2 cents per 2 minute ad clip, trailer, etc. You will still make substantially less than minimum wage watching them. Fusion Cash can earn you a little more by referring people. However, most will bug their friends (in real life and social media) and family, and possibly create hostility towards you for it. Another issue with this task is that, unless one knows how to market or promote elsewhere, your resources are already limited. Going outside your small circle involves spending your own money – again – buying ad space in places you know will get traffic, etc., all without a stitch of training from Fusion Cash. No expert marketer will waste that time or money on such small commissions, so, again, ask yourself why you would as a total rookie. Getting paid to click a 2 to 3 minute ad could make a little, but you have to sit there all day to still not make it worth your while for what you’d make. 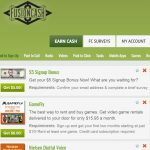 The Fusion Cash listen to radio task earns you about 6 cents an hour. I won’t even get into all the other mind numbing menial tasks that “earn” you such whopping fortunes. All I can say we can’t really call this a scam since it costs nothing to join, is only in the US, and does payout no matter how small. However, we don’t recommend Fusion Cash for all the reasons above and more.